Birkwood House was originally built as a stately home in 1887 for the McKirdy family and was later donated to Lanarkshire Council in 1923, who then converted it into a hospital for children with learning disabilities. The main building was further extended over the years and several other buildings were erected on site to accommodate the ever growing need for more beds. After the Community Care Act in 1990 many long-term psychiatric hospitals closed, and this led to Birkwood finally closing its doors in 2005. 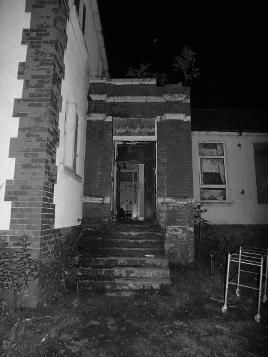 Birkwood Hospital has had many reports of paranormal activity. We arrived at the site around 11pm and made our way to the main building - the castle. Unable to find a way in we made our way back to the buildings we had passed on the way in. We entered one of the buildings and explored it a bit, then decided to find a place to start calling out. We found a room and I called out for a while. We got no response but we continued to call out hoping for something to happen, but nothing did. We moved on to the next room and again began to call out. While we stood quietly I heard what sounded like voices from outside. The voices were faint and I could not tell what was being said, but there was someone out there. We stood quietly expecting to hear the voices again, thinking it was other explorers, but we heard no more. After a while we called out again and we started getting some KII meter activity. I was stood in front of the open door at this time and as soon as the KII meter went off I felt like I had goosebumps on the bottom half of my legs. I often get goosebumps while investigating but usually on my arms, never my legs which I thought was a bit weird. We also felt the atmosphere in the room change as the KII meter started going off. We carried on calling out and the KII meter continued to light up on and off for about 5 mins. Things started to quieten down and we experienced nothing else in this room so we moved on to the next. We continued to explore and investigate the building, and we were still hearing the voices from outside. At one point I even thought I heard someone in the corridor leading off the room we were in, which Becky also heard. Again we could not work out what was being said, we just heard talking. If there was someone outside we were sure we would have seen them by this point. We had been investigating for a few hours now and we had experienced a few bangs and taps as well as the KII meter activity but nothing else, so we decided to call it a night and head out. In this clip we are stood in a large room in one of the buildings. While standing calling out, we hear a noise that sounds like something being dropped or a tapping sound. This was heard by Becky and myself. In this clip we had moved upstairs to a smaller room. While we were setting up our equipment Wayne, who was filming at the time, heard a knocking sound. Becky and myself didn't hear this as we were busy unpacking equipment. The sound that you can hear on the camera is the velcro on one of the pockets of our camera bags. On the replay, the knock can clearly be heard in between the sound of velcro and us unpacking equipment. This clip is about 3.5 minutes long, and we are stood in the same small room as the clip above. While we were calling out we asked if there was a spirit in the room could they go towards the green light that Becky was holding, which was the KII meter. Almost straight away the KII meter began to light up. The feeling in the room had definitely changed, as Becky and myself felt it. During the KII meter activity, I was stood in the opening of the doorway which led out on to the stairway and I felt goosebumps on the lower half of my legs. Towards the end of the clip, while I was still stood near the open door, I clearly heard voices coming from the stairway. In this clip we were back downstairs in a different room than we were in before. This was captured on the voice recorder while calling out. We are unsure if this is a voice we have captured but the majority of the group think it is. If this is a voice, we are unsure what's being said. It was very faint and could only be heard with headphones, but we have cleaned it up the best that we can. Here we are stood in the same room as the clip above. Wayne had been crouched on the floor filming, and as he got up and said 'my legs are going to give up any minute now' an unexplained sound can be heard just after he speaks. As you can tell I have edited the swearing in my reaction to this noise!